SusieQTpies Cafe: Link up Family Favorite Recipes today in the Gooseberry Patch Round up! 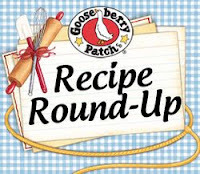 Link up Family Favorite Recipes today in the Gooseberry Patch Round up! for birthdays or it's you special Tuesday taco salad that they love so much. Shared by Annette Kennon of Auxvasse, Missouri, this recipe is, as she says, "A quick and hearty meal my family loves every time I make it." We're sure your family will enjoy it too! Combine all ingredients except crescent rolls in a saucepan; cook over medium heat until heated through. Pour into a greased 13"x9" baking pan; unroll crescents over top of chicken mixture. Bake at 400 degrees for 15 minutes or until crescent rolls are golden. Serves 8 to 10.